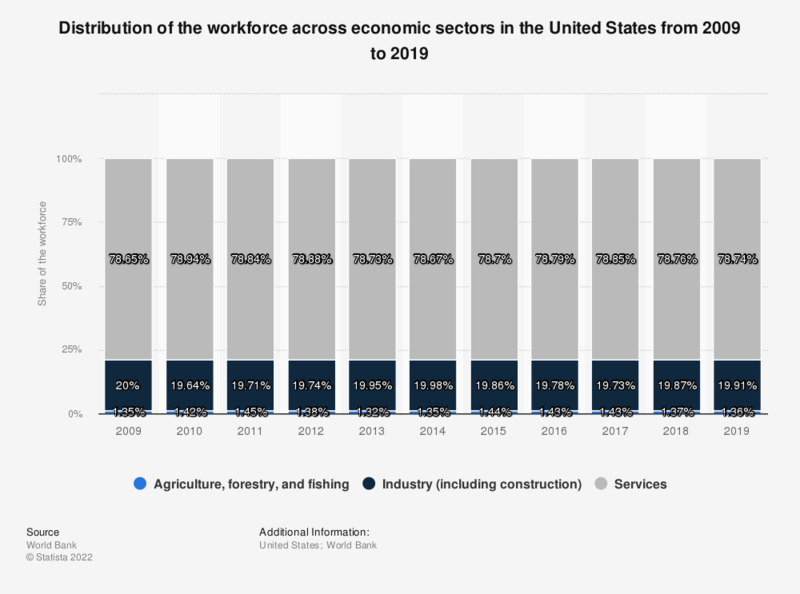 The statistic shows the distribution of the workforce across economic sectors in the United States from 2007 to 2017. In 2017, 1.66 percent of the workforce in the US was employed in agriculture, 18.89 percent in industry and 79.45 percent in services. See U.S. GDP per capita for more information. A significant majority of the American labor force is employed in the services sector, while the other sectors, industry and agriculture, account for less than 20 percent of the US economy. However, the United States is among the top exporters of agricultural goods – the total value of US agricultural exports has more than doubled since 2000. A severe plunge in the employment rate in the US since 1990 shows that the American economy is still in turmoil after the economic crisis of 2008. Unemployment is still significantly higher than it was before the crisis, and most of those unemployed and looking for a job are younger than 25; youth unemployment is a severe problem for the United States, many college or university graduates struggle to find a job right away. Still, the number of employees in the US since 1990 has been increasing slowly, with a slight setback during and after the recession. Both the number of full-time and of part-time workers have increased during the same period. When looking at the distribution of jobs among men and women, both project the general downward trend. A comparison of the employment rate of men in the US since 1990 and the employment rate of women since 1990 shows that more men tend to be employed than women.